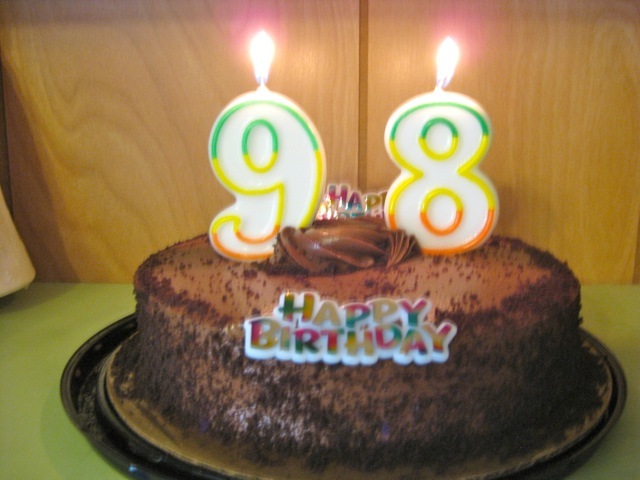 If she lives until October 4, my Aunt Ruthie will also have a “98” on her birthday cake. Like your mother, Ruthie has no awareness of what day it is. Her grasp of where she is, wobbly too. Yet she had a remarkable life. Your mother’s smile and nod were visible reminders that the spirit doesn’t age, though the body and mind may fail. What a lovely tribute and how wonderful four generation could participate. This post brought tears to my eyes because I could read what you did not write. It was special, Marian. This time last year, she ate cake and clapped her hands when we sang; this year, the smile and head nod at the stories was all she could manage. Your birthday wishes and time with your mom is a precious love of family. Thanks for sharing with us and know your mom is a beautiful lady. I love her so. 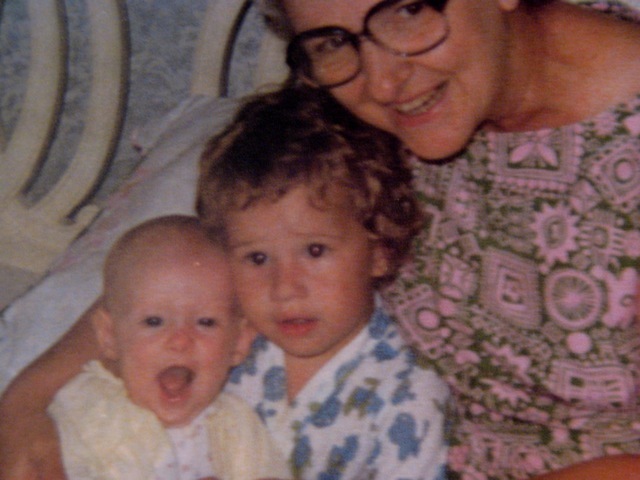 With the loss of my own mom last year, she was my comfort as I care for her. Hope to see you, on next visit. Sorry I missed you and the party. If you’d been at our little party, you could have gotten Mom to eat some cake, Tammy. I remember last year when we had Boston Cream cake and you were the one who could get her to eat. What a sweet and lovely birthday celebration. 98 and still smiling; that’s wonderful. Mostly she sleeps now, Gallivanta, so every little smile is precious. I think there were moments when she did realize something special was happening. Happy Birthday to your mother! How wonderful that she responded to your stories. No doubt she felt the love, even if she did not understand the occasion. 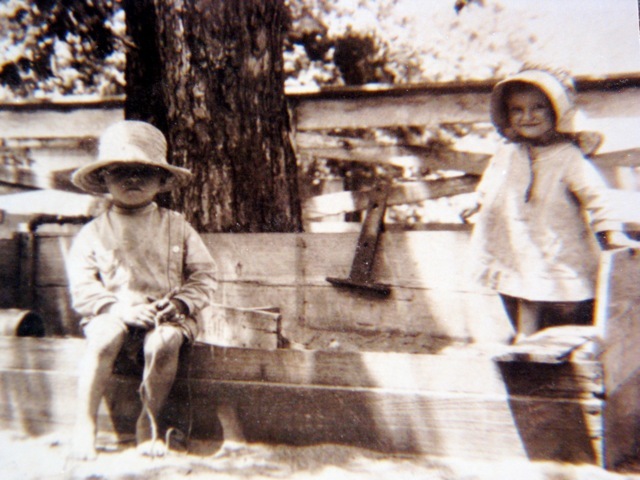 I love the photo of her and her brother on the farm, and her sweet-faced college graduation photo. Thank you, Merril. I hope she did sense how much we all love her and were glad to be with her. How very poignant, and thanks for sparing her the dignity of a photo for your audience. Some things are not to be photographed. Your love and care and respect for your mother in all her stages is so motivating. My main “loss” regarding my mother right now is that it has become very difficult to have a meaningful conversation on the phone, but yet I know she could so easily be in your mother’s shoes. Mom is almost totally deaf now, must depend on a Captel caption device for her phone and while it’s mistakes in captioning make her laugh, it is frustrating when we can no longer have the meaningful mother-daughter chats we used to enjoy. Now I kind of listen and understand that she’s only getting half of what I say. Thankfully, it is much better in person. These losses also make us think ahead to our own, eh? I am also struggling with hearing issues as I wrote about in my Another Way newspaper column recently, and have no doubt I will be similarly frustrating to talk to on the phone when I get older. So it goes. Thanks for helping us all process our aging–and our parents’ and other loved ones. Oh, Melodie, I know how frustrating it is when you can’t talk on the phone with your mother. It’s been more than a year since my mom could understand at all what I was saying over the phone. And in the last few months, even in person there are only a few shining moments when she understands what’s happening. We lose them in increments, and though it’s discouraging, it also gives us time to process the ongoing levels of loss. Thanks for your comments about what you’re experiencing; it reminds me that we’re all processing the aging process, for our parents and ourselves. Sunrise, Sunset has that effect on me, too, Julia, but now I find myself humming it a lot. There were only about a total of 2 minutes of awareness from my mother during this trip, but we were glad to have that much. So, yes, this trip was definitely bittersweet. Sounds like your mother is declining, Marylin. I’m sorry. I love the way you chose those two quotes as an introduction to your description of what age 98 looks like for your mother. You have a wonderfully connective imagination. And it inspires me to see how four generations can learn from your mother, and from you, what love looks like after much loss. We will all experience the same one way or another some day. Blessings in this day. Your mother has had a good long life filled with love and happiness. So many can not say the same. 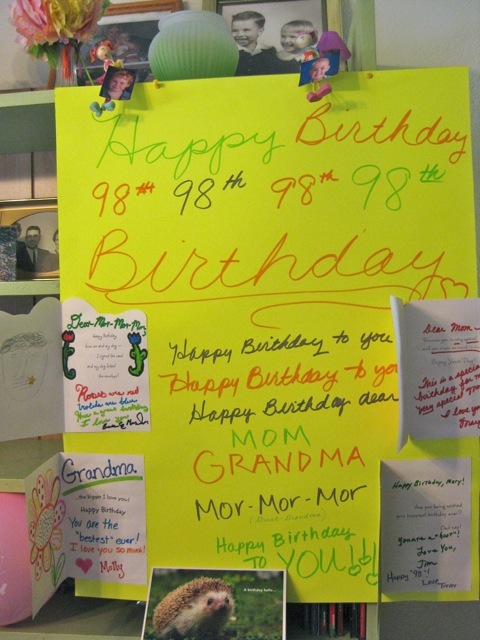 It is nice you could all be there for her on her 98th birthday. I love the pictures of when she was younger, especially the one with her brother. She certainly has, Darlene, and we’re very grateful. So touching that she responded, Marylin. Makes every mile you drove worthwhile. So true…every day is a celebration! It does, Nancy. This visit had the least amount of responsiveness, but I’m still grateful for the few smiles of recognition. It made her birthday a celebration. 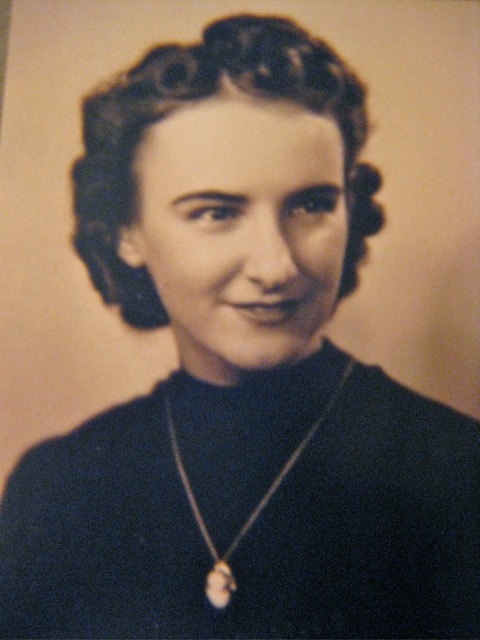 Oh a very happy belated 98th birthday to your sweet mom, Marylin. Wow! 98. Grace and Gannon sure do know how to make things bright! I’m so glad I found your blog! It’s so sweet of you to share those precious memories. I’ve enjoyed learning her story. I’m so glad you found it, too, Jessica. Welcome! Scroll back through previous blogs for the posts I did on Abilene and the Eisenhower library and museum. Love the ways you find to continually show your mother her importance to you and the impact she had in your lives–she must have been very special and so are you!! To Mary on her 98th birthday: How heartwarming that you were able to respond to the family memories about you. If I were at the party, I would have thanked you for the love, appreciation, and encouragement you frequently gave me over the years for taking good care of Marylin and Molly. Your art was terrific with it, Jake! Thank you so much, Jane. ❤ your sweet comments. Thank you. Happy Birthday to you, Happy Burthdsy to you. Happy birthday dear Grandma, happy birthday to you! We sure had s wonderful time decorating her apartment, sharing treats, and spending time with her! Although it is always better when she is awake more, the times that she acknowledged us was true. She knew what we were saying was about her! I loved hearing the stories that the kids shared. It’s always fun to experience things through their eyes! Hope to do same thing next year!